Subsequently, he served as delegate to the Philippine Assembly and became the Speaker of the House of Representatives in 1916, then elected senator. He founded the Nacionalista Party, which became dominant in the Philippine political life. Osmeña led several missions to the United States to campaign for Philippine independence. 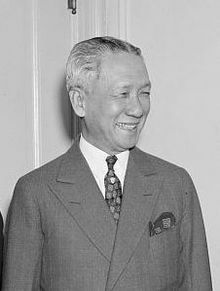 He became instrumental in gaining commonwealth status for the Philippines in 1935. A known right-hand man and confidante of Manuel L. Quezon, Osmena supported the former as President of the Philippine Commonwealth by serving as vice president. They were reelected for another term in 1941. Osmeña assumed the presidency in 1944 after the death of Quezon on August 1, 1944 and sat until May 28, 1946. He accompanied General Douglas MacArthur during the landing of U.S. forces in Leyte on October 20, 1944. After establishing the beachhead, MacArthur handed the reins of civil government to Osmeña, as the successor of Quezon. Osmeña died on October 19, 1961 at the age of 83. He was buried at the Manila North Cemetery.